I don't usually bring you book reviews on a Monday. But with the lead-up to Christmas and the holidays almost upon us, I wanted to make sure you knew about this little beauty. It's Diary of a Wombat, written by Jackie French, illustrated by Bruce Whatley. This miniature edition was published by Angus and Robertson/Harper Collins in 2008 (buy from Booktopia). To celebrate the 10th Anniversary of Diary of a Wombat, the publishers have packaged the book with the sweetest plush toy version of Mothball the wombat, complete with carrot. Cuddle your very own wombat while you read the book! Award-winning author Jackie French′s love of wombats comes alive in this cheeky observation of Mothball′s life, while Bruce Whatley′s captivating illustrations of Mothball′s antics shows just how entertaining and endearing wombats are to humans. If you don't know Diary of a Wombat, I urge you to seek the book out and discover for yourself why this children's picture book is so popular! Because this is a 10th Anniversary Edition, let's take a look at ways to deepen children's experience of Diary of a Wombat. Using books as springboards to other learning activities offers so many wonderful creative opportunities, and Diary of a Wombat is perfect for this. * Look closely at the illustrations. Find places where the illustrations tell a different part of the story to the text. * Create your own picture of a wombat. Can you show your wombat having a battle with a flat hairy creature? * Innovate on the text: Examine the diary format and create a diary for another character. Suggestions: a different animal, a nursery rhyme or fairy tale character, a fantasy creature, a well-known character from a book. Kids could also find a picture of a character and, imagining his/her life, deliver some details in diary or journal format. The app, iDiary could be useful if you have an iPad. * Research: What do we know already about wombats? What else would we like to know about them? How could we discover answers to those questions? Once research is done, let's think how to record and present that information. * Wombat information at ARKive. * Wombat information at Animal Discovery. * Here's an interesting ABC video about two rescued wombats. * How to Draw a Wombat. * Wombat clipart: Clker, Arthur's Clipart. 1. Just imagine wombats don't live in burrows. Create a new home for Mothball that you think she might like to live in. 2. Write a letter to Mothball, telling her about your life. Add some sketches of you. 3. Imagine you are a wombat. 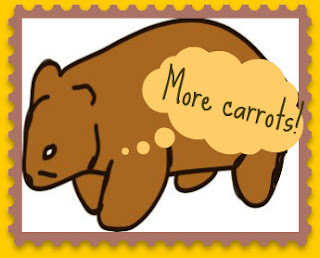 Write a letter to your pet humans to persuade them to give you more carrots. 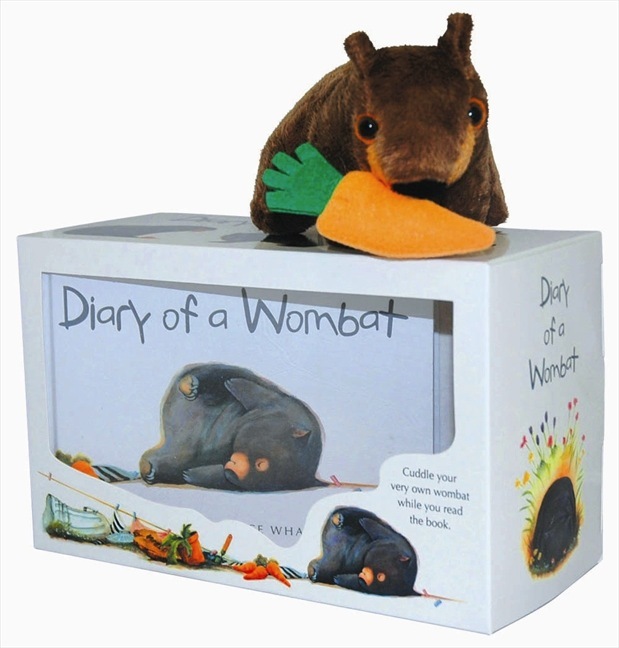 Diary of a Wombat, complete with plush Mothball, would make a charming Christmas gift for a child. If you're looking for more bookish gift suggestions, try Christmas Gift Ideas for Kids.